The recent publication of John Burnheim’s autobiography by Sidney University Press (Burnheim, 2011) coincides with improved availability of his 1985 work, Is Democracy Possible? (Burnheim, 2006). Although SUP republished the book in 2006 they have only recently made it available on Amazon.com. John very kindly sent me copies of both books, even though he knew that I would not be the most sympathetic reviewer, as we have always disagreed fundamentally on the potential of sortition in our offline exchanges. John divides his adult life into three two-decade periods during which he moved from the priesthood through philosophy to retirement, pausing en route only to (assist in) blowing up the Sydney University philosophy department (1973) and publishing an attempt to torpedo democracy in its modern incarnation (1985). Interesting observations by a randomly selected barrister (lawyer) on Citizens’ Assembly experiment in Ireland. The organisation behind it, ‘Wethecitizens’, is non-governmental, and looks excellent. For non-Irish: Oireachtas is Government, Seanad is the Upper House, like the House of Lords. It is sad to see that this exercise did not recommend Sortition for the Seanad. OPINION: I was selected to take part in the citizens’ assembly – but what exactly is the aim of the experiment? LAST WEEK, I was selected randomly to participate in an experimental citizens’ assembly. It met over a day and a half last weekend at the Royal Hospital Kilmainham (originally to be the seat of the Oireachtas in 1922). I met lots of people who were engaged and pleased to be selected. The event was run by the “We the Citizens” project, funded by Atlantic Philanthropies, the organisation founded by Chuck Feeney. There is one crucial thing we can learn from Athenian democracy in this respect. The ancient democracy was established by overthrowing tyranny and equipped itself with a meticulous device for preventing tyranny for reviving. The salient characteristic of Athenian democracy is not a direct participation of everyone in the assembly, as always claimed, but a systematic control of the administrative power. The crux was the system of lottery: to elect public servants by lottery and to surveil the deeds of public servants by means of a group of jurors who are also elected by lottery. […] My point is that the core of the system invented to stop the fixation of power in Athenian Democracy lay not in the election itself, but in the lottery. Lottery functions to introduce contingency into the magnetic power center. The point is to shake up the positions where power tends to be concentrated; entrenchment of power in administrative positions can be avoided by a sudden attack of contingency. It is only the lottery that actualizes the separation of the three powers. If universal suffrage by secret ballot, namely, parliamentary democracy, is the dictatorship of the bourgeoisie, the introduction of a lottery should be deemed the dictatorship of the proletariat. Can we choose all representative by lottery in all elections? That is not realistic; the system itself would be too arbitrary to gain the trust of the people. [W]hat is preferable to us would be to choose the most crucial post by lottery: namely choosing three candidates by secret vote (three in one choice) and then finally electing one by lottery. Because the last and most crucial stage is determined by contingency, factional disputes or conflicts over successors would not make sense. I recently linked to a WSWS story about the Indignants in Syntagma Square. The Kathimerini newspaper has a story as well. As can be expected, the tone is much more equivocal. Costas Douzinas, a law professor at Birkbeck, University of London, recently penned one of the most flattering profiles of the Indignants in Britain’s The Guardian newspaper, after being invited to speak in Syntagma. For him “this is the most political movement we have had in Greece, and perhaps in Europe for the past 20 years. It is totally political and in a way it changes our understanding of what politics means,” he says. I’m wondering if anyone has a recommended reading list. In particular what are opinions about either of the following regarding relevance to the promotion or understanding of sortitional selection? 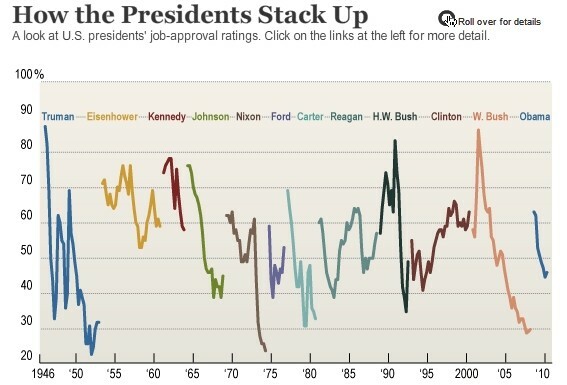 The Wall Street Journal has a chart illustrating the pattern of high approval rating for incoming U.S. presidents followed, almost invariably, by disappointment. Bill Clinton seems the only clear exception to this pattern since WWII. What’s Next California is an unprecedented attempt to bring the people into the process in a new way—one that is representative and thoughtful. A scientific random sample of the entire state will be transported to a single place for a weekend of face-to-face discussions, in small groups and in dialogue with competing experts. In California’s first statewide “Deliberative Poll,” the people will be supported by factual information and will consider the critical arguments on both sides of issues, then will articulate their priorities for fixing the state. A number of Deliberative Polls have been conducted at the national and local levels in sixteen countries around the world, including Britain, Australia, Denmark, and the United States. The deliberations will take place in Torrance on the weekend of June 25th. More than 300 citizens representing every region of the state will spend the weekend working in small groups and posing questions to public officials and policy experts. These in-depth discussions will likely range over legislative representation, taxation, whether local governments should have more autonomy and control over public services, and the initiative process.